"Aqua Room Series: Clay Bodvin"
After a long stream of occasional glimpses; snippets of information; and virtual viewing of assorted images on screen here is the first opportunity to experience, in the flesh (so to speak), a substantial collection of Clay Bodvin�s new photomedia work. For two months, from May 4 thru to July 2 06, the artist will present over 30 new works in the Street Gallery at Lopdell House Gallery, Titirangi, New Zealand. Several other new pieces can also be seen in a concurrent show at EA Gallery, 3a/47 High St, City. These two projects are the culmination of the better part of 7 years investigation and development for the artist. Bodvin admits his art practise is informed by an appreciation of post-modern critical thinking. And the work does indeed stem from a conceptual artistic foundation celebrating fragmentation and the ironic, nostalgic refashioning of art-historical conventions and contemporary cultural artifacts. Thus, Clay�s choice of contemporary creative media (where images are transformed into their essential fragments of pixel and colour) is entirely appropriate and fortuitous. The use of digital photomedia not only facilitates but enhances his re-composition of subject matter and extensive manipulation of the image surface. A large range of these virtual rooms and interiors are shown as 170mm sq images on paper. With a selected few given unexpected impact at 500mm sq, on paper (some placed in the Gallery Shop). Other work - self-portraits; an animation-strip assemblage; an overdrawn, marouflage panel; and large-ish works on canvas offering stylistic and compositional variations on some of the rooms and interiors - show the artist�s range and versatility. The traditional artist�s screen is cleverly used to confront the viewer with an unusual situation - another (life-size) room inside the gallery. But the liquid Sitting Room Screen is not a room to physically enter, rather just to scrutinise and peer into. A prime example of the use of the capabilities of inkjet printing technologies to create dramatic and unusual art. A new creative direction for the artist is also shown, publicly, for the first time via an 1800mm sq diptych on loose canvas. This Serial Still Life piece refers to the resurgence of a painting/composition style known for the repetition of patterns, grids and colour swatches. 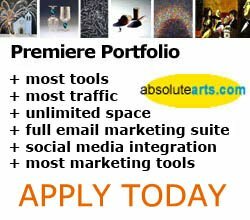 To review a portfolio of more work by Clay Bodvin visit http://www.absolutearts.com/portfolios/m/mediummixer/.